Voles are small, weighing 1 to 2 ounces as adults. Their overall adult body length varies from 3 to 5 1/2 inches in the pine vole, to about 4 1/2 to 7 inches in the meadow and prairie voles. Voles construct well-defined, visible tunnels, or “runways,” at or near the surface, about 2 inches wide. Vole runways result from the voles eating the grass blades, as well as from the constant traffic of numerous little feet beating over the same path. And if any lawn and garden pest can literally “beat a path” through the grass due to their sheer numbers, it’s the voles. Pest Solutions 365 can determine the size of the vole infestation and your pest control needs with a professional pest audit. Only $25 for a 20-minute inspection. 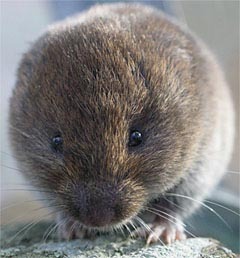 Reduction of large vole populations is accomplished most effectively with baits. On large areas of land, it is suggested that 5 to 10 pounds of bait per acre is sufficient to gain control. Hand-baiting is the only application method that can be used in urban areas such as lawns, ornamental plantings, parks and golf courses. Toxic bait also may be broadcast-applied according to label directions. Broadcasting will increase the amount of bait applied per acre and the hazard to non-targeted wildlife. Use of toxic bait is most appropriate in young woody plantings or orchards, when habitat reduction efforts have failed to keep vole populations in control.